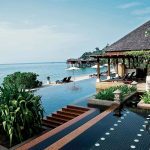 Review Pangkor Laut Resort, Malaysia. Imagine a powdery white beach with crystal clear waters where the sounds from the ocean is mixed with jungle sounds, in absolute peace and tranquillity. The frazzling sound from the palm trees, swaying in the breeze. Well, I think you get the picture. I am going to let you in on a secret and tell you that this stunning scenery actually exists at Pangkor Laut Resort in Malaysia. Very few resorts stand the test of time but Pangkor Laut Resort truly does. It is the perfect vacation spot if you are looking to relax, be pampered and enjoy good food. The best part is that there are no other resorts on the island. It could have stopped there, but there is so much more about the secluded island on Malaysia´s west coast. I hope you will enjoy my views and my review of Pangkor Laut Resort. Pangkor Laut Resort seen from the sea. 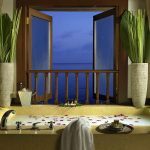 Private dining in spa hut at Pangkor Laut Resort, Malaysia. Infinity pool at Royal Bay Beach Club at Pangkor Laut Resort, Malaysia. It is only a 20 min boat ride from the resort´s private jetty in Lumut to the hotel´s jetty. Majority of routine paper work is taken care of at the mainland jetty office so you are ready to hit the beach, spa or restaurants when you arrive on the island. Getting to Lumut from Kuala Lumpur is about a 4 hour drive, depending on traffic, from where you start and how many stops you plan to do. You can land a helicopter or moor your yacht on the island if you prefer that kind of transportation. Once you arrive at Pangkor Laut Resort you will enjoy a warm welcome, its low key architecture and cosy environments. Entrance walkway at Pangkor Laut Resort, Malaysia. Lap pool at Spa Villag, Pangkor Laut Resort. 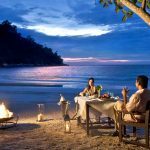 How about a romantic dinner on the beach at Pangkor Laut Resort, Malaysia? There are several types of accommodation to choose from and I like indulging in a suite from time to time but I have to say that my favourite room category are the Hill Villas. Living quarters are nicely decorated with all bells and whistles you can expect. This is the lead in room category and housed in 2 storey buildings in the lush gardens and usually closest to the main building. These 2 storey houses are perched on the hillside and are almost identical to the Garden Villas. The only reason I like this type a little more is the amazing view and has a feeling of freedom and air when not surrounded by jungle like vegetation. Be sure to lock your balcony door when you leave or you might get an unwanted visit from a monkey. This type of villa has a large balcony with deck chairs and a large open air bath room. In spite of the name, these villas are not ideal for swimming and you have to swim at Emerald Bay. You should know that the main walking trail to the main building is not far from the beach villas. 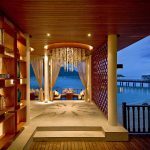 Over water villas, standing on stilts and linked together by wooden walkways where you will find a patio with deck chairs and the same open air bath as in the beach villas. After the Hill Villas this is my favourite room type at Pangkor Laut Resort. This type of villa is very similar to Sea Villas but these villas have direct access to the Spa Village. In these you will have the opportunity for private sun bathing. Usually you can get a good deal with spa treatments included in the rate. Check with your travel agent. There are Suria, Purnama and Pavarotti Suites as well but I have very little knowledge and information about these and do not dare to say if they are worth the money or not. 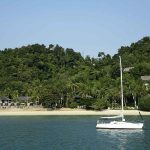 If you want to acquire your own piece of paradise, you can do so at MUSE Pangkor Laut Estates (formerly known as Pangkor Laut Estates only) which are located on the northern vicinity. Hill Villa at Pangkor Laut Resort, Malaysia. 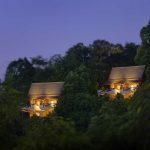 Hill Villas at Pangkor Laut Resort, Malaysia at night. 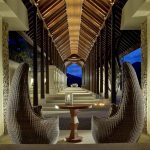 Standard interior at Pangkor Laut Resort, Malaysia. 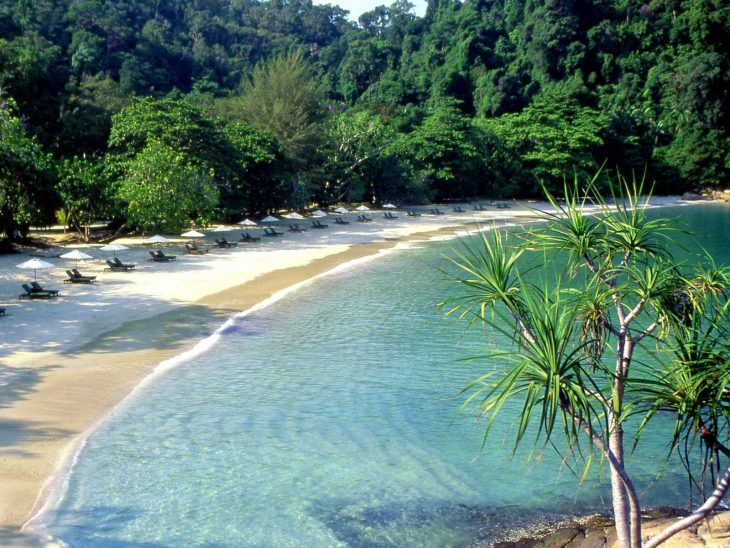 Beautiful Emerald Bay is where you want to go swimming in the ocean on Pangkor Laut Resort. It is a stunning beach surrounded by rain forest and a tranquil place to relax. You will surely eat well when staying at Pangkor Laut Resort. There are 7 restaurants with the highest quality of food. Your travel agent should be able to get you a sweet deal on half or full board. 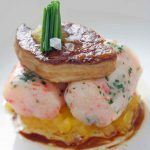 Is probably the very best restaurant on the island, serving interesting Asian flavours and is located by the sea. Please note that there is a dress code and children has to be 16 years or above. Is usually where meals included in the room rate are served and also the breakfast restaurant. Is in the Feast Village and serves Japanese cuisine for lunch. Can also be rented for private dinners or functions. Chapman is said to be a British Colonel who sought refuge at Emerald Bay before he escaped by submarine. Its location, at Emerald Bay, makes the name make sense and serves salads, noodles, burgers and other beach friendly dishes. During daytime Asian and Western lunch is served here, overlooking the infinity pool. At night this is where you want to be lounging with a nice cocktail in your hand, feeling fab after a perfect day! Named after the chef who has been with the resort since it was opened. Interesting design and overlooking the sea, serving Asian dishes and Chinese home style cooking. This is where you will enjoy western grill or fresh seafood and is located next to the Spa Village. Please note that this is a restaurant for 16 years or older. I love places like this! Feast Village at Pangkor Laut Resort, Malaysia. One of the tasty creations from the restaurant at Pangkor Laut Resort, Malaysia. 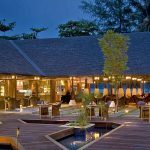 The Straits Restaurant at Pangkor Laut Resort, Malaysia. The hotel´s oriental junk in teakwood is available for sunset cruises where you will be able to enjoy cocktails from the open bar. There are several snorkelling and fishing spots around the island, easily reached them with the motorboat available on the premises. If you are going snorkelling, please do not forget to bring some extra sunblock to make sure you are not kept awake at night by a sunburnt back. There is no golf course on the island but Damai Laut Golf & Country Club is only 20 min from Lumut which means you will have a total travel time of 45 minutes to the course. Not bad for being on a secluded tropical island. If you are interested in food you should absolutely do this during your stay. It is not only about listening to the Executive Chef telling you everything about cooking because you will also make a visit to Pangkor Island fishery, dried seafood markets, the noodle maker and the floating fish farm. Exactly what it says on the label and great fun to experience! Imagine being in paradise and designing the perfect sarong for next vacation. You will be able to enjoy tennis courts and a squash court on the island. Of course, there are the usual spa, gym, Jacuzzi, swimming pools, Tai Chi, jogging trail, water sports and yoga to choose from. If you are looking for an adrenaline filled vacation you are in the wrong place but if you want to have options, then you are in the right place. 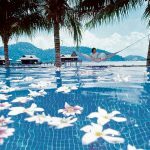 Pool at Royal Bay Beach Club, Pangkor Laut Resort in Malaysia. Getting a Thai massage at Pangkor Laut Reosrt, Malaysia. There is a conference and banquet hall where you can host all types of meetings and gatherings. Personally, I would not use this property for a hard-core conference but if you have a team you want to reward, spoil and maybe do some team building exercises, it might be the perfect spot. The good thing with having everyone on one little island is that there are not many places to go, they simply have to meet eventually. If you are looking for the best resort of the world to hang with the hip crowd this year, it might not be the holiday destination for you even if the hotel has withstood the test of time extremely well. If you are looking for a great luxury holiday or a honey moon at an excellent value for money then this is the place for you! I recommend Pangkor Laut Resort highly and always have happy customers here. It is professionally run by skilled people. 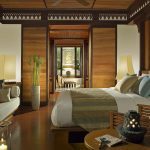 Pangkor Laut is easily combined with Kuala Lumpur or Singapore, where you can splurge on a stay at the iconic Raffles Hotel? If you involve any of theses cities in your trip you will be able to comine with almost anything because there are excellent flight connections with the rest of the world. The resorts Youtube film is a bit dated but still gives a great idea of what it looks like. If you want to, please check out my other hotel reviews. If you enjoy reading about Malaysia I have a couple of more articles about Malaysia here. I hope you enjoyed the review Pangkor Laut Resort. Do you have questions or experiences of Pangkor Laut Resort or other island resorts in Malaysia? Please let me know on Twitter, on Facebook or in the comments below. Skateboarding Helsinki Airport Vantaa (HEL).